Huge Savings Item! Free Shipping Included! 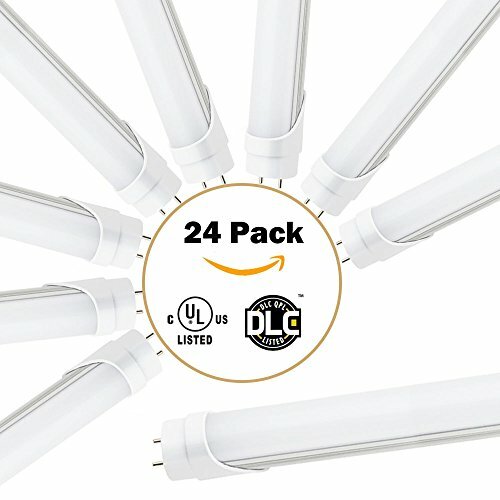 Save 19% on the 24-Pack T8 LED Light Tube, 4FT, 20W (40W equivalent), 5000K Daylight White, 2400 Lumens, Dual Ended Power, UL-Listed & DLC-qualified, Super Value, Maximum Energy Saving (24, Frosted Cover) by myYARD at Blog Free Here. Hurry! Limited time offer. Offer valid only while supplies last. Tell us about your fluorescent lighting application, and you will be provided the BEST solution. ECO FRIENDLY NO Hazardous Materials. NO Flickering. Tell us about your fluorescent lighting application, and you will be provided the BEST solution. NO Hazardous Materials. NO Flickering. NO UV Light. NO Buzzing Ballast. Size: 24-PACK, Available with Clear and Frosted Cover. Exceptionally Durable With A 45,000+ Hour Lifespan. Work on all US home and office standard bi-pin lampholder. Installed in Office, Room, Shop, Home, Super Market, School, Factory, Warehouse,Workshop, Gas Station, Residential etc. SAVE INSTANTLY - Save 50% on your electricity bill! Replace 40W fluorescent tubes with 20W LED. DLC and UL approved - Makes it one of the safest and reliable T8 bulbs in the market. WIDE APPLICATION - Preferred by most of contractors, electricians and wholesalers. Installed in office buildings, schools, hospitals, hotels, workshop and parking lots etc. Ideal for both indoors and outdoors. EASY INSTALLATION - Make sure the connection of the wire is correct, then just remove the ballast and plug it in! HASSLE-FREE WARRANTY - Five-year unlimited warranty means we've got you covered! Contact us for an easy and fast replacement. If you have any questions about this product by myYARD, contact us by completing and submitting the form below. If you are looking for a specif part number, please include it with your message.